Our investment totals the past few months have been dropping fast, kind of like GM stock. We’ve lost roughly three times what we paid for our first house back in 1971. And I don’t think the bleeding of dollars from our retirement fund has ended. I don’t look forward to getting each month’s new statement. Health permitting, I probably have another seven or eight years to go before retirement. Our investments will have some time to climb out of the hole they’re now in. It’s the folks who are now retired or about to retire that I feel most sorry for right now. * It appears some lenders and some borrowers made some mighty poor decisions in the past. I’m not all that smart when it comes to dollars and cents. But I’m smart enough to know that if a lender talks people with a poor credit history, or people who simply can’t afford to buy a house, into buying one there just might be a problem down the line. In addition, when I’ve heard of folks borrowing money for houses on adjustable rate mortgages, with future balloon payments or based on the incomes of both a working husband and wife, warning flags waved for me, if not for them. * I’m not sure that throwing money at Wall Street — Uncle Sam bailout style — was the answer. But Congress and President Bush did it despite many objections from voters. It’s over and done. The trouble is, everyone with the inability to manage their money — from nearly bankrupt states to U.S. automakers — are now lining up with their hands out. More bailouts? Why? I’m not seeing a whole lot of evidence that the Wall Street bailout has done much good. Sadly, he says that funny because it’s true. * People are scared. Lots of people are afraid of losing their jobs and their houses these days (many already have lost one or both) so, generally speaking, they’re spending less money and they’re borrowing less money. The marketplace is having to adjust to this. The first two full weekends each October, Sherry and I take in the fall festivals in Knox and Fulton counties in Illinois and Van Buren County in Iowa. It’s a get-away tradition we look forward to. Vendors in the various villages we visit sell everything from arts and crafts to furniture to homemade apple butter to flea market items. When we visited the first weekend in October, it was obvious there were fewer vendors and customers in both Knox and Fulton counties. Only about half of the usual number of vendors had set up shop this year in courthouse square in Knoxville, Ill. Curious, I later chatted with a vendor from the St. Louis area in Lewistown, Ill. This was when fuel was approaching $4 a gallon. She told me their sales and traffic were down this year, and she wasn’t sure if she and her husband would return for the 2009 edition of the Spoon River Valley Scenic Drive. “It cost us $400 before we even sold one item,” she said. That included the vendor fee at the Lewistown Fairgrounds, hotel rooms for the two Saturday nights they were away from home and the fuel required to pull their heavy trailer of merchandise from their home to Lewistown and back two weekends in a row. London Mills, Ill., was another tipoff that it wasn’t business as usual this year. We usually have to wait in a long line of cars to get into that community, one of the more popular stops on the scenic drive. But this year there was no waiting — we drove right in to town and parked. The second weekend in October, I spoke at length with a vendor in Keosauqua, Iowa, on a Saturday night after he had completed the first of two days of business during the Villages of Van Buren Scenic Drive Festival. He said the number of people who had walked past his stand, where he sells craft items made by his mother-in-law, had been close to normal. But he said customers were spending considerably less money per purchase than they had in years past. * Wal-Mart isn’t hurting. While people may be spending less money these days, they are parting with a good portion of it at Wal-Mart. The company reported its net sales for the quarter ended Oct. 31 were $97.6 billion, an increase of 7.5 percent from the $90.8 billion in the third quarter last year. Wal-Mart income for the third quarter was up 6.6 percent from a year ago. Lee Scott, Wal-Mart president and chief executive officer, said in a news release that the company is optimistic about the upcoming holidays. “At a time when our customer is feeling the pressure of a tough economy, Wal-Mart’s price leadership is more important than ever,” he said. Let’s hope consumers also remember their neighbor, the local retailer, when they make their purchases. For younger readers, a layaway allows customers to reserve merchandise, pay for it in installments and pick up the items when they’re paid for. * Even before the economy went south, Sherry and I had decided to pretty much switch from the use of credit cards to debit cards. Credit cards, while convenient, result in monthly invoices, which, if paid in full and on time, don’t result in a credit charge. But the danger with credit cards is, people have a tendency to use them too often and spend too much. Then it’s difficult to pay all the bills when they come in to avoid the hefty finance charge. Debit cards, on the other hand, immediately deduct money from a bank account to pay for a purchase. Using them is sort of like writing a check. The downside for us in making the switch from credit cards to debit cards has been going through touchpad hell trying to cancel our credit cards by phone. Furthermore, the push-button options in the recorded message at credit card companies usually don’t include one for canceling an account. What a surprise. Copyright Nov. 20, 2008. This “Everyday People” column appeared in The North Scott Press, Eldridge, Iowa. 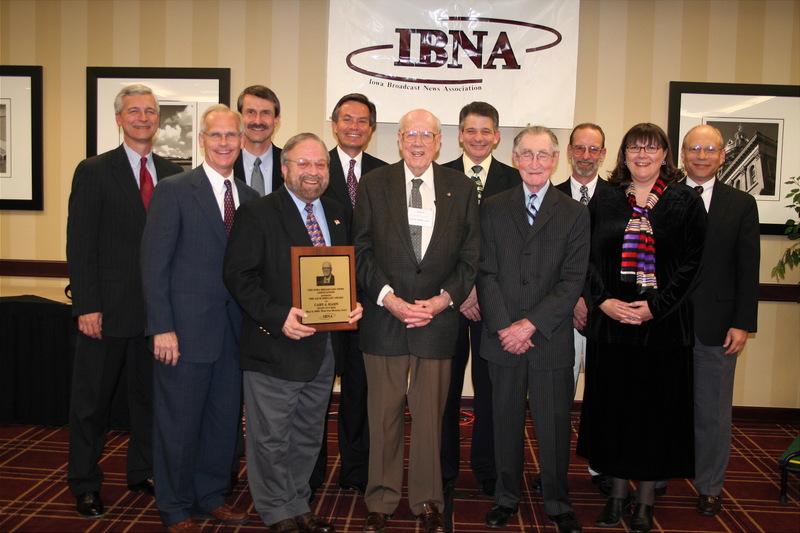 J.K. Martin, third from the right, is shown with fellow Shelley Award winners in this photo I took a couple of years ago. They found J.K. Martin last Monday. He was unconscious at his home, and he died there. And I’m sad. J.K. Martin was a fellow broadcaster. Until earlier this year when he lost the job he’d held since since 1990 when new ownership took over, he had been the news director at some Burlington radio stations. J.K. was a talented journalist with a distinctive voice. I can still hear his reports in my head as I think about him on this cloudy day. Goodness knows I heard plenty of J.K.’s stories at awards banquets — he won scores of Associated Press and Iowa Broadcast News Association awards for them. J.K. trained a lot of young newspeople over the years. He had been a respected member of IBNA and its board. And he had won the highest award they hand out in Iowa news broadcasting, the Shelley Award. But more important to me than all those things, J.K. was a good friend. His death was a horrible shock. It still is. It came way too soon; he was only 51. I didn’t see J.K. much. Sometimes it was only once a year at AP and IBNA gatherings. But he always was upbeat and smiling, a cigarette in one hand and a cold drink in the other. J.K. had many “war stories,” was lots of fun and I always looked forward to spending time with him. That’s over now. Life isn’t going to be quite the same. We’ll all go on, but there will be always a void left by his absence. And I’m sad. Rest in peace, J.K. Martin. Rest in peace, old friend. John Kent Martin, 51, of West Burlington, Iowa died at 11:00 a.m. Monday, November 10, 2008, at his residence. He was born March 1, 1957 in Springfield, Missouri to John T. and Janyce D. (Bell) Martin. On July 17, 2006, he married Amy Jo Diercks. J. K. was a Kansas City Chiefs fan and enjoyed traveling. As a young man he was an Eagle Scout and played the trombone in the High School Jazz Band. Following college, he wrote a news column for a Fairfield newspaper. He was past president of the Iowa Broadcasters Association and held many positions with them. He was a long-time member and past president of the Iowa Broadcast News Association, won numerous I.B.N.A,. awards, served as president of the Iowa Associated Press Broadcast Board, was a representative and member of Radio-At-Large, and won numerous Iowa Associated Press broadcast awards, including the Overall Excellence Award. J. K. also sat in as an invited panelist for the Iowa Broadcast News Association convention in San Antonio, Texas. He also won the Jack Shelley Award in 1996. J. K. was a member of the Christian Church (Disciples of Christ). Survivors include his wife Amy Jo; his mother, Janyce Linville of Sarasota, Florida; mother and father-in-law, Delbert and Bonnie Diercks of Burlington; three sisters, Susan Lynn Myers-Cohn of Shawnee, Kansas, Karen Leigh Martin of Ocala, Florida and Amy Laurel Lassen of Sarasota, Florida; two brothers, Steven Scott Martin of Cape Coral, Florida and Christian Thomas Martin of Ozark, Missouri and several nieces and nephews. J. K. was preceded in death by his father. J.K. was more than just a voice on the radio and will be fondly remembered by many.